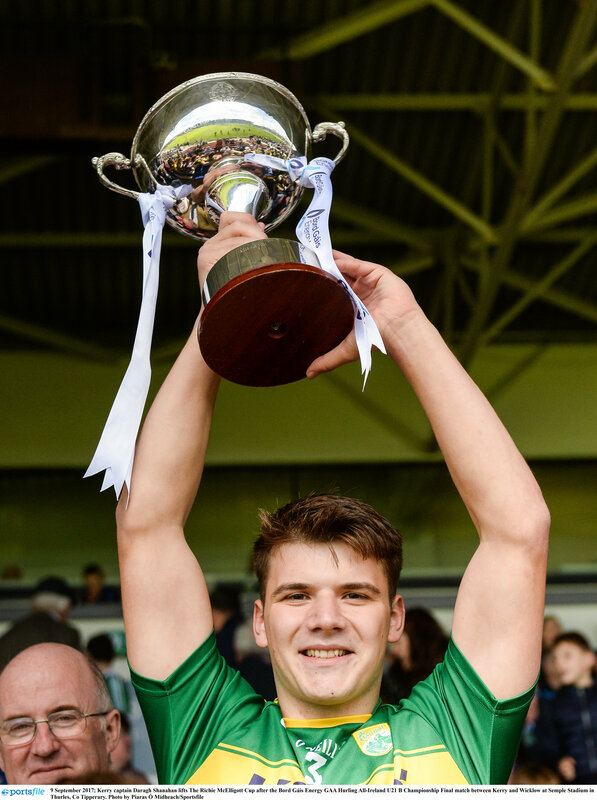 Kerry eventually laid their hands on the Ritchie McElligott Cup when defeating Wicklow after a tough encounter at Semple Stadium this afternoon. The winners were made work all the way by a physically stronger Wicklow outfit and their cause was certainly not helped when they shot 11 wides when wind assisted in the second half. Kerry, who were forced to line out without injured captain, Darragh Shanahan (Ronan Donovan was drafted in up front with Jordan Brick going to defence) were slow to get to grips with the game and they were 3 poits to 1 adrift inside the opening 8 minutes as Wicklow used the wind advantage. Two pointed frees from Shane Conway had the sides level by the 13th minute however and Kerry’s improvement continued with further points from Ronan Donovan and Jordan Brick to lead by 5 points to 3 at the end of the first quarter. However, Kerry allowed Wicklow to get a grip on proceedings and when Michael Bolan goaled after a great initial save by Stephen Murphy, Wicklow were 1-4 to 0-7 to the good. However, Kerry’s response was good with Jack Goulding getting a good score and the same player had his shot almost finished to the net by Brandon Barrettbefore the break at which stage the Leinster side led by 1-5 to 0-6. Jack Goulding gave Kerry the perfect start to the second half when he pointed a sideline cut and when Shane Conway pointed a long range free the sides were level. Kerry, despite having ample possession were finding it difficult to make headway against a tough defence who always had an extra man helping out and Wicklow struck for a goal in the 41st minute when Boland again found the net . Kerry’s response was immediate however with Jack Goulding picking out Shane Conway from the puckout and the Lixnaw man made no mistake from close range to leave the sides deadlocked on 1-9 to 2-6 at the three quarter stage. The Kerry wides were adding up but then in the 48th minute, a high delivery into the danger area fell nicely for Maurice O’Connor who first timed to the net to give Kerry a lead they never lost. Wicklow did not throw in the towel and added two pointed frees as Kerry introduced fresh legs in Daniel O’Carroll and Robert Collins and O’Carroll chipped in with a badly needed point in the 54th minute to put Kerry 2 ahead. Kerry had ample opportunities to double that lead at least but they just could not find their rhythm from play until two pointed frees in the 57th and 61st minutes courtesy of Shane Conway finally killed off the Wicklow challenge. After the game, Darragh Shanahan was presented with the Ritchie McElligott Cup by Uachtarán Tofa CLG, John Horan and how fitting it was that a Lixnaw man should receive the trophy named in memory of one of the parish’s famous sons. Jack Goulding was named the Bórd Gais Eireann Man of the Match. Scorers Kerry: Shane Conway 1-6 (0-6 frees), Jack Goulding 0-3 (0-1 sideline), Maurice O’Connor 1-0, Ronan Donovan, Jordan Brick and Daniel O’Carroll 0-1 each. KERRY: Stephen Murphy; Stevie O’Sullivan, John Buckley, Billy Lyons; Eoin Ross, Jason Diggins, Jordan Brick; Barry O’Sullivan, Tomas O’Connor; Ronan Donovan, Michael O’Leary, Shane Conway; Maurice O’Connor, Brandon Barrett, Jack Goulding. Subs: Daniel O’Carroll for Ronan Donovan (46), Robert Collins for Brandon Barrett (51).